Miss Magpie: Please can there be more days in December? Please can there be more days in December? I'm still in denial about Christmas (shhh!) here at Magpie Towers. My daughter is turning 16 next week and I'm desperately trying to get her something made that I can give her on the day, I've always been adamant that her day shouldn't coincide with the other one that happens on the 25th. That said, poorly children and a poorly Mr have been cluttering up the house this week so not much making happening, just a bit of knitting. 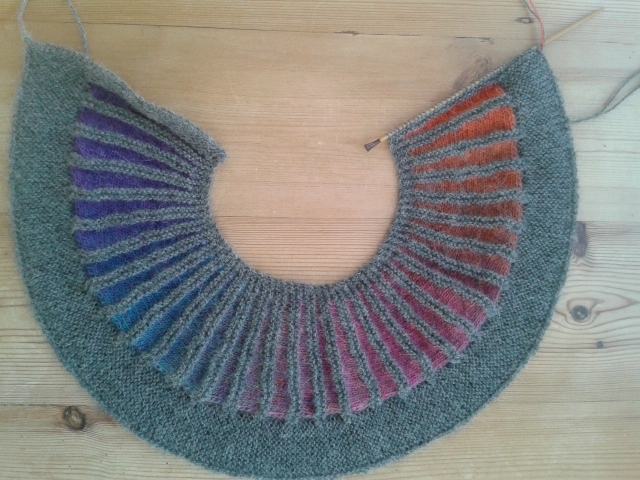 Since this is not yet halfway through, the Spectra isn't a contender for most on time birthday present, but I am enjoying knitting it very much because of the short rows and the interest of getting to the next colour. I will definitely be making another for me.